Welcome to the Treehouse...a fantastic vacation getaway perched among a majestic hillside of the San Jacinto mountains in Idyllwild, California. Relax in the peace and quiet of this privately located cabin, featuring breathtaking views of the treetops, boulders and crestline. Enter the gates and leave your cares behind! You'll enjoy top-notch amenities to make your stay most comfortable. We offer luxury bedding with feathertop beds and premium towels. This finely-appointed cabin maintains its rustic charm, yet has been updated for modern comfort and is beautifully decorated in a cozy French Country style. Sit back and enjoy scenic views as you lounge on the redwood deck overlooking the tops of towering pines or cozy up with a book in front of the fire. 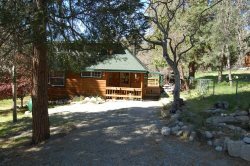 This quaint home is nicely secluded yet only 0.8 miles to the village of Idyllwild. Idyllwild is one of Southern California's best kept secrets. Just 2 hours from Los Angeles and San Diego and 45 minutes from Palm Springs. This wonderful alpine village features hiking, rock climbing, quaint shops, fabulous restaurants, and is reknowned as "one of America's top-100 art gallery towns." In a town with not one stop light and a pace of days-gone-by, you'll slip back into time and appreciate the tranquility of this remote mountain community.